Contact: Eddie North-Hager at (213) 740-9335 or edwardnh@usc.edu. The first confirmed new tenant for USC Village is Trader Joe’s, a specialty grocery store that will serve students and neighbors beginning Fall 2017. Community-serving retail was a central promise of the student residential and retail complex, the biggest development in the history of USC at $650 million and one of the largest in the history of South Los Angeles. The store, to be located on the northwest corner of Jefferson Boulevard and Hoover Street, will measure approximately 12,700 square feet. Trader Joe’s bills itself as “a unique, neighborhood grocery store with foods and beverages ranging from the everyday to the exotic.” The chain was founded in 1958 in the Los Angeles area and now includes more than 400 stores in 40 states. The USC Village Trader Joe’s will be the closest location for residents of downtown Los Angeles, where many USC students, faculty and staff reside. The university officially launched construction of the USC Village project on Sept. 15. “In the past four years, we have been privileged to break ground on a number of new projects at USC. 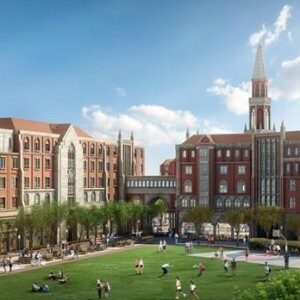 But this village is an especially historic moment for USC, for our neighborhood and for Los Angeles as a whole,” USC President C. L. Max Nikias said during Monday’s official groundbreaking ceremony for USC Village. Besides Trader Joe’s, the complex will include a drugstore, fitness center, Trojan Town USC store, restaurants and outdoor dining, parking and a community room. Bank of America and Starbucks are among the returning tenants. Tree-lined entrances will lead to a central plaza surrounded by outdoor dining and community-serving shops and cafes. 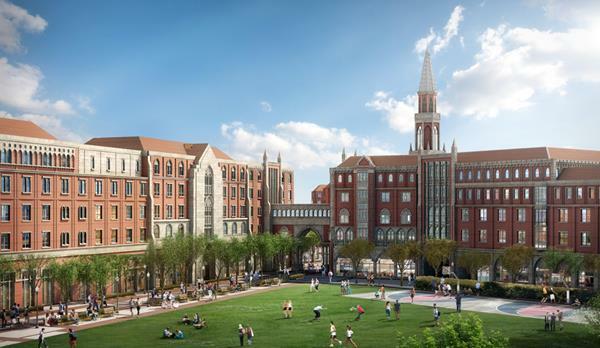 A cluster of five-story residence halls and a clock tower in the Collegiate Gothic architectural style will rise above USC Village, housing up to 2,700 of USC’s top students under the mentorship of senior faculty masters.